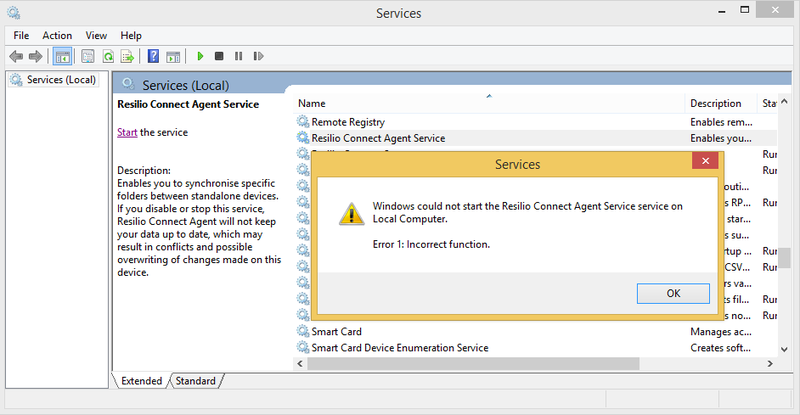 If you try to start the service and get an error message saying "Windows could not start Resilio Connect Agent Service on Local Computer. Error 1: Incorrect Function", the problem might be in a missing or misconfigured sync.conf file. 1) Make sure that there is a sync.conf file in C:\Program Files\Resilio Connect Agent or the directory where you chose to install the agent. If it's not there, re-download the config from Management Console and put it to the directory. 2) Check sync.conf's content. It's a JSON format, so you can run it through any online json validator, or visually check the syntax.